Greenpeace defied Russian authorities Saturday by deploying an icebreaker through an Arctic shipping route without permission to protest against oil drilling. Greenpeace ship Arctic Sunrise, seen in Fray Bentos, Uruguay, on March 20, 2006. The group says it has deployed its icebreaker through an Arctic shipping route to protest against oil drilling in the fragile ecosystem, defying Russian authorities. The Russian transportation ministry immediately accused the Dutch-flagged vessel of “crudely” violating Russian and international law. Nevertheless Vladimir Chuprov, head of the Russian energy unit at Greenpeace, said the icebreaker was so far moving forward unhindered by military ships or border guard vessels. Earlier this week Greenpeace said Russia had refused permission to enter the Northern Sea Route on several occasions citing concerns about the icebreaker’s ability to withstand thick ice. The global environmental group has called the move “a thinly veiled attempt to stifle peaceful protest”. 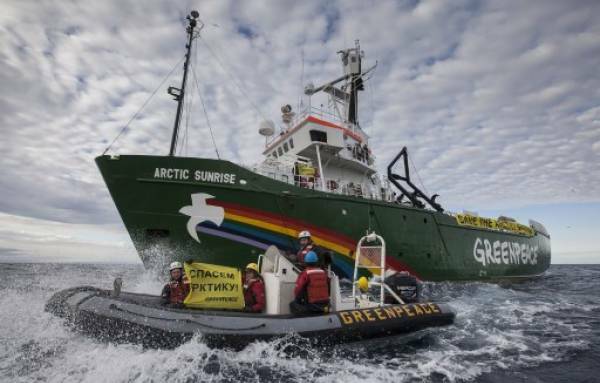 In defiance of the Russian authorities, Greenpeace said its ship Arctic Sunrise entered the Northern Sea Route at 0330 GMT Saturday to protest plans by the country’s top oil firm Rosneft and its US partner ExxonMobil to drill near the Russian Arctic National Park. “We refuse to let illegal attempts by the Russian government stop us from exposing dangerous oil drilling in the Arctic,” Christy Ferguson, a Greenpeace campaigner aboard the ship, was quoted as saying in the group’s statement. “The Russian Arctic National Park is a special place full of rare and threatened Arctic wildlife, and faces an infinitely greater threat from reckless oil companies than a fully equipped Greenpeace icebreaker. “If Rosneft and ExxonMobil bring in offshore drilling platforms they will risk catastrophic blowouts and spills that could devastate the region,” said Ferguson, adding that the two oil giants “rely on secrecy and evasion”. Ferguson, in a blog posted on the Greenpeace website, branded ExxonMobil a “profit-hungry monster”, saying it “has partnered with Rosneft to take advantage of weak legislation and a lack of accountability in Russian waters”. The Arctic Sunrise was heading to the Kara Sea where several vessels contracted by Rosneft and ExxonMobil are conducting seismic testing to prepare for offshore drilling. Russian officials said the ship owner was violating Russian law and the UN Convention on the Law of the Sea. “The transportation ministry sent a letter to the foreign ministry with a request to get in touch with The Netherlands’ maritime authorities with the aim of influencing the owner of the vessel on behalf of the flag state,” a spokeswoman told AFP. The Russian foreign ministry did not immediately react. Dima Litvinov, a Stockholm-based Greenpeace activist, called on the Dutch government to support the campaign. “At the very least, I would certainly hope that the Dutch government would support the legitimate claim and the right of passage into that area,” he told AFP. More than 400 vessels have already been permitted to enter the shipping route this year, the group said. Greenpeace said the plans to drill in the protected ecosystem were in contravention of Russia’s own laws. Established in 2009, the natural park is home to endangered species such as the bowhead whale, and it is a major breeding ground for polar bears. Rosneft, headed by one of President Vladimir Putin’s closest confidants, Igor Sechin, said its offshore operations were “absolutely safe”. “High-technology solutions which will be used to implement the Arctic projects are capable of ensuring maximum environmental safety of the works,” the company said in a statement sent to AFP. Russia and the United States hope that the global warming melting the Arctic sea ice will help them tap the vast oil and gas resources believed to be buried in the region. Putin has pledged to turn the Northern Sea Route into a key shipping artery, part of the Kremlin’s bid to mark out its stake over the energy-rich Arctic. The 60-year-old Russian strongman, who has made much of his concern for wildlife, has been pictured kissing animals.